LANGUAGE. Over the telephone. You lost your language, your weight, that last seriousness you still. I was not going to cry at your funeral, but I cried nonetheless; this bird's flight… etcetera. It was worse than silence. That presence as an entire room incarnate, that cliché of an invisible shadow; there – no, there. Like an old, unmarked, postcard out of a drawer. Like going to the market and coming back with just that carton of cow's milk. Absent like something in flight, to say something; to miss someone else's flight, to lose your clothing. Finally we were that same age. I sat on the back row hating you. Today you are there like any other emptiness. 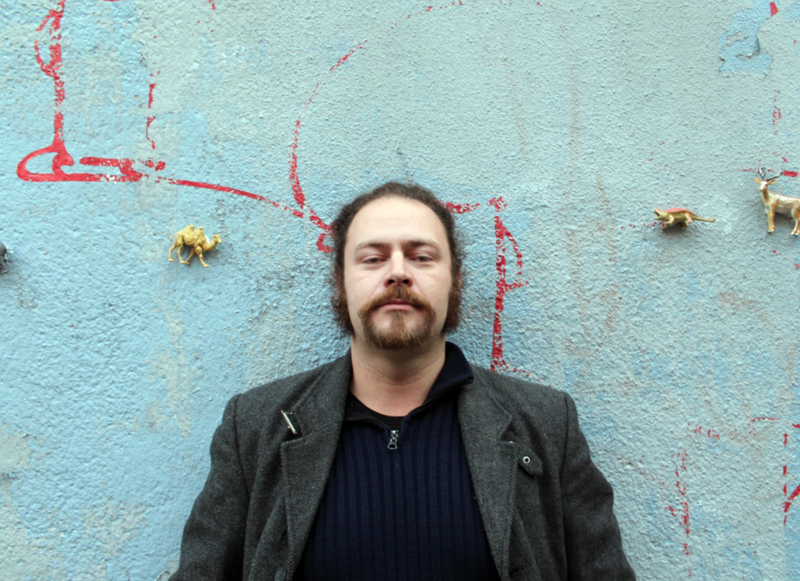 Freke Räihä, born 1978, is a poet and sometimes everything else in publishing. List of publications include Red Ochre, OEI, Ygdrasil, Truck, Lyrikvännen, Slagtryk, Serum and Ord&Bild and a whole lot more – most recently poems from Nomos was included in Paris Lit-Up 4. Nomos was Räihä’s 2012 BA in Creative Writing from Lund University. The MFA will be final in 2018. Other relevant education might be Skurups Folkhögskolas Skrivarlinje (writing) and Skurups Folkhögskolas Skrivarpedagoglinje (teaching CW) besides the other BA in publishing studies, some comparative literature, bakery, parenting and graphic design. In 2017 book number 14 and 15 will see the the light of night. Three books are available in English from Corrupt Press and Moria Books. Erin Marie Hall is a poet and visual artist from South Bend, IN. Her work, which explores nostalgia, poetics, the body, and the apocalyptic, appears in Rust + Moth, After the Pause, Rogue Agent, and your nightmares. Find her on Twitter @erinmariehall. I started the Luna Luna monthly flash contest for two reasons: one unselfish—and one selfish. First, I wanted to create a recurring 'contest' where a theme would be announced on-spec, without any notice, on the first day of each month. Why? To bolster creativity and spontaneous response. To create a sense of a goal we could all work toward together (creative work!) and to, well, create a sense of community. Because whenever I've entered a contest—whether I won or didn't—it was always nice to see who did win, and to read their work. I hope this contest can be something you look forward to monthly, a little light in the dark, a little something strange and fun you can do at the beginning of each month. And because the contest runs at the beginning of each month, it's like a little birth, or a little ritual of creative welcoming. (That said, there is no monetary prize, and no print publication—but Luna Luna will publish your work digitally, pair it beautifully with art, design it, and promote the hell out of it on social). The second reason was more selfish: I wanted to read your work—lots of it, and quickly. I wanted to just drown in idea and voice and variety, and I wanted to move through my own feelings about the topic (death) by exploring your approach to it. It was so worth it. Thank you all for submitting. 160 of you submitted. I narrowed the finalists down to about 15, and from there I picked three. It was difficult, and I am truly honored to have read all of your work. I loved each and every poem for different reasons. The poems I picked I chose because they were carefully and thoughtfully constructed, the language was startling and surprising, and the treatment of 'death' was unique. All of the poems lingered on my spirit—their shapes, their voices, their pain, their craft, their music. I did NOT pick poems based on the poet or their bio (which I do not read or care for with the slightest). I picked the poem itself. With no further ado, the winners are below. The poems will be live within the day, and will be widely shared on social media. Stay tuned for the next contest, which will be revealed on September 1 across our social media and on this website. Cornelia Barber is a New York writer. In her duel writing and healing work she investigates lineage, intimacy, race and the psychic and physical ecologies of people, plants, places and animals. Her work can be found in Prelude, The Felt, Berfrois, Fanzine, The Poetry Project Newsletter, Entropy, Weird Sister and more. She is an editor at Queen Mobs Teahouse and currently works on her late father, author and political theorist, Benjamin Barber's archive. Erin Hall is a poet and visual artist from South Bend, IN. She earned a BA in English at Indiana University. Her work, which explores sexuality, mental illness, the body, and the apocalyptic, has appeared or is forthcoming in Unlost Journal, After the Pause, Rust + Moth, and your nightmares. Born in 1978. Educated as a baker. Debut in print 2001. Studied five years at two of the most prestigious creative writing-schools in Sweden: Skurups Folkhögskolas Skrivarlinje and Författarskolan at Lund University. And a course in Comparative Literature Fantasy at Växjö University where I wrote a paper on The alienation of the Hero/Villain: Uppsats om utanförskapet hos hjälten/skurken. Also, amongst other things, former literary curator at Tidningen Kulturen and lector at Telegrafstationen. In 2012-2014 I studied ways of publishing at Malmö University and the publishing business at Lunds University where I wrote essays about literary criticism and the dominant currents in Publishing education. 2016-2017 I attended the Skurups Skrivarpedagoglinje which made me a better teacher of poetry. I normally teach poetry on a freelance basis. 2016 was also the year I debuted as a news journalist and I have written articles for Kristianstadsbladetsince then. Since 2017 I am also a student in creative writing at Konstfack. Stay tuned for the poems! 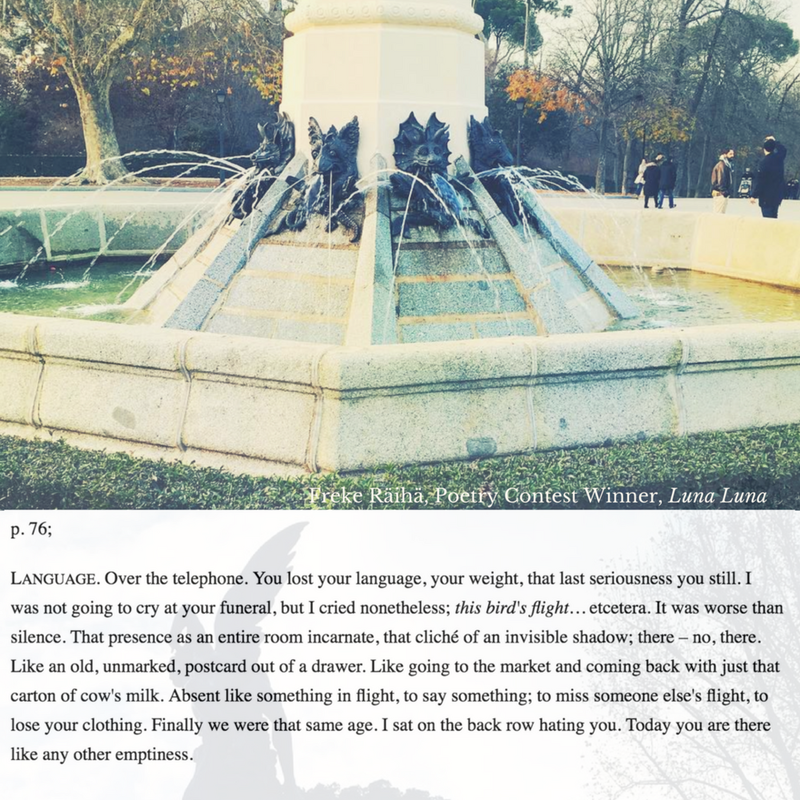 Lisa Marie Basile is an editor, writer and poet living in NYC. She is the founding editor-in-chief of Luna Luna Magazine and the author of APOCRYPHAL (Noctuary Press, 2014), as well as a few chapbooks: Andalucia (Poetry Society of New York), War/Lock(Hyacinth Girl Press), and Triste (Dancing Girl Press). Her book NYMPHOLEPSY (co-authored with poet Alyssa Morhardt-Goldstein), was a finalist in the 2017 Tarpaulin Sky Book Awards. Her poetry and other work can be or will be seen in PANK, Spork, The Atlas Review, Tarpaulin Sky, he Tin House blog, The Huffington Post, The Rumpus, Rogue Agent, Moonsick Magazine, Best American Poetry, Spoon River Poetry Review, PEN American Center and the Ampersand Review, among others.